The Reproducible Companion/CD kit for the second level of Alfred’s popular sight-singing curriculum is now available! 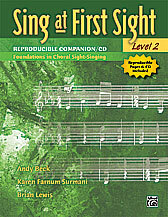 This sequential sight-singing text introduces new music reading concepts using both rhythmic and pitch exercises, plus actual excerpts from real choral music. The new Reproducible Companion/CD offers additional exercises, activities, and assessments, plus a CD with accompaniments and ear training lessons. The comb binding creates a lay-flat book that is perfect for study and performance. This title is available in SmartMusic.